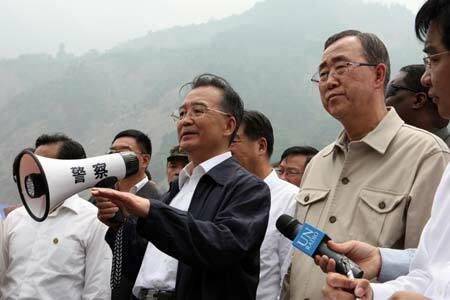 Premier Wen Jiabao and UN Secretary-General Ban Ki-moon visited the quake epicenter on Saturday in Southwest China's Sichuan Province as the UN chief met quake victims and witnessed the devastation first-hand. Ban met in Yingxiu, one of the towns hardest hit by the tremor, with Chinese premier Wen. "If we work hard, we can overcome this." The two held a press conference on the rubble of the quake-flattened town. It was Wen's second trip to the disaster area after the May 12 deadly quake struck Sichuan. Wen also introduced China's quake relief effort to Ban and said China would carry out reconstruction as soon as possible. The UN chief arrived in Chengdu, capital city of quake-stricken Sichuan Province, Saturday morning and later visited the Yingxiu Town, one of the worst-hit areas. "The whole world is standing behind you and will help you," Ban Ki-moon made the remarks in an open area shortly after his arrival at the town. Ban promised to mobilize efforts from his organization to support China's quake relief and post-quake reconstruction. He said the two sides (UN and China) will assess the quake damages to help rehabilitation and reconstruction. Ban praised the Chinese leaders for their outstanding leadership in quake relief, and wished Chinese people a victory in quake relief. "The Chinese government, at the early stage of this natural disaster, has invested strenuous effort and demonstrated extraordinary leadership." Wen, on behalf of all Chinese people and his government, extended gratitude to Ban for the world body's support and help for China's quake relief. Speaking at a press conference, Wen said there are three main difficulties now facing the disaster relief work: First, more tents are needed for the homeless people. The premier urged one camp primary school should be established for the children accommodated in every 1,000 tents and one middle school for those in every 2,000 tents. Second, to prevent epidemic. Until now no epidemic outbreak has been reported but the government has pledged to keep transparent if there is any epidemic report. Third, to cut off pollution sources and reserve cultural heritage. The premier also urged reporters to record the real situations to memorize the dead and console the survivors. "We hope foreign reporters will follow their conscience and stict to humanitarian spirit," Wen said. The State Council has placed the confirmed death toll at 60,560 from the 8.0-magnitude killer quake and counted 26,221 more people as missing. And on Saturday, Premier Wen Jiabao said the death toll ultimately could "further climbe to a level of 70,000 or 80,000 or more." "Previously our main priority was the search and rescue of affected people," Wen said. "Our priority now is to resettle the affected people, and to make plans for the post-quake reconstruction." China is struggling to cope with the immediate crisis, which is to provide temporary shelter to an estimated 5 million people left homeless by the earthquake. Beijing has made an emergency appeal to other provinces to provide tents for the large numbers of people whose homes have been destroyed and who have no other shelter.